The inaugural J Class World Championships drew to a close in Newport over the weekend (August 26), with Lionheart (pictured above, left) coming out on top. 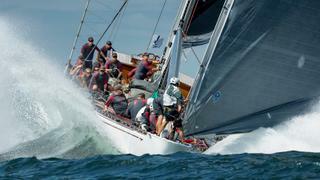 The owner-skipped yacht was a worthy winner, finishing in the top three for all seven races of the regatta. Tactician Bouwe Bekking led the crew to the title with consecutive second-place finishes in the final two races. “It is a special title, one for the owner who gives us so much confidence in ourselves and who gives us carte blanche in how we set the boat up and how we sail,” he said. Lionheart’s victory, combined with previous triumphs at the America’s Cup Superyacht Regatta and America’s Cup J Class Regatta, means that the 43.4 metre Claasen yacht also took home the Terry Kohler Trophy for the overall season champion. 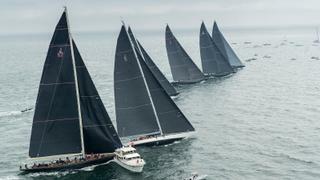 The sight of J Class yachts racing in Newport was a truly historic one, as this is the first time these classic yachts have graced the Rhode Island waters together since 1937 America's Cup. The J Class Association assembled a truly impressive fleet for the regatta, with the newest J Class yacht Svea joined by restored original Velsheda and modern replicas Ranger, Lionheart, Topaz and Hanuman. Another new-era J Class yacht, Rainbow, which is currently offered for sale, was also in attendance. 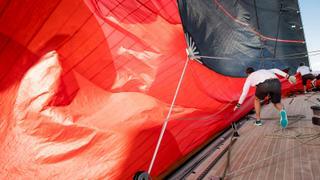 Delivered by Dutch yard Vitters earlier this year, Svea turned heads in Newport with her bright red spinnaker. This dramatic on-board photo was taken on Day Five by Onne van der Wal and gives an idea of the co-ordinated effort required to sail such a monumental yacht to the best of her abilities. The first of the modern-era J Class yachts, 41.55 metre Ranger was launched by Danish Yachts in 2003. Her performance in Newport was something of a mixed bag, recovering from a slow start to record four successive podium finishes, including first place in Race Five. 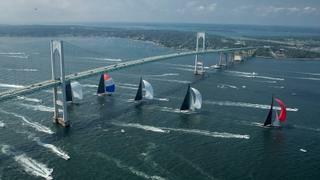 Indeed, four of the six yachts competing managed at least one win in Newport — a fact that highlights how evenly matched they are. The week got off to a dramatic start when Ranger shut out Velsheda during Race One of the J Class World Championships, leaving the 38.5 metre yacht with nowhere to go. Despite clipping a signal boat, she was able to continue, but could not catch up with her rivals and finished in sixth place. Velsheda’s fortunes improved with two second place finishes in Races Two and Three, however two further sixth place finishes meant she finished the week in sixth overall. 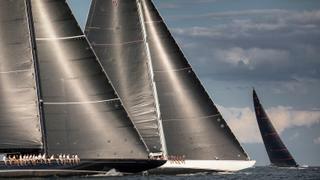 Immense forces are channelled through the sails of J Class yachts during a regatta and as a result, accidents can happen. 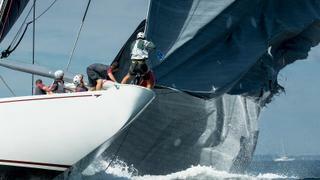 This spectacular shot of Ranger blowing a sail was captured on Day Two of the J Class World Championships. Despite this dramatic mishap, she finished the day with a respectable return of a third place finish and a fourth place finish.